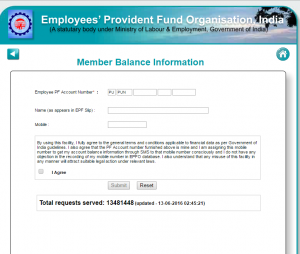 EPF stands for Employee’s provident Fund. 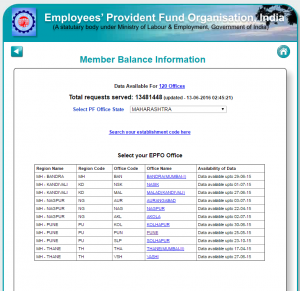 There is website which provides you details about EPF balance and it is maintained by Employee’s provident fund organisation, india. Click the below link “Click here to know your PF balance” on page. Select your Office. You will be taken to next form. Tick I Agree and click submit. You will receive SMS shortly. Customers who want to know their total PF balance can just give a missed call on 01122901406 from their registered mobile numbers. Post that the customers will get an SMS alert immediately.